5½-inch diameter amber safelight filter (the approximate equivalent to a Kodak OC or Ilford 902 filter) to fit Kodak Model A and Model B "beehive" style safelights. These permanently pigmented plastic filters can't shatter, as can happen with glass filters. 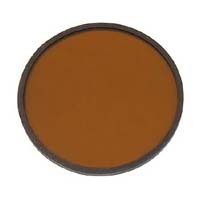 Amber colour OC-type filters are suitable for use with most B&W photo papers. Please refer to the product data sheet packed with the material you are using to confirm that this is the recommended safelight filter for that specific material.